David De Gea had a night to forget as Manchester United lost 3-0 to Barcelona to bow out of the Champions League. United’s goalkeeping coach was upbeat of De Gea’s preparation for the tie, but it was not to be for the Spaniard. 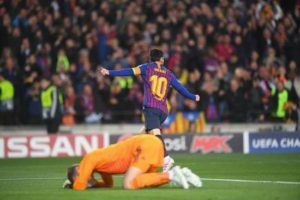 De Gea made a huge error when he let Lionel Messi’s tame shot slip under him. That goal effectively ended the tie, and United’s comeback hopes. Before the game, United goalkeeping coach Emilio Alvarez was talking to a radio station. De Gea has not signed a new contract at United yet, as the likes of PSG are hovering about for his services. Yesterday’s performance was definitely not a good look for potential suitors.